The inquiry put forward within the framework of POPULISMUS is firmly located within the field of representation in both its meanings: as political representation, a means to influence decision making on behalf of popular claims or demands, as well as symbolic/discursive representation, a process of articulation through which such claims/demands are shaped, staged, invested, accepted or rejected. This is an ambiguity that POPULISMUS will have to take seriously into account. POPULISMUS is designed on the basis of carefully addressing the aforementioned points. It purports to articulate an approach to populism registering the intrinsic signifying link between ‘the people’ and populism, accounting for the irreducible instability representations of the people historically acquire and for the antagonistic language games in which they are inescapably involved. And yet, this challenge is not merely theoretical, conceptual and/or historical. It is predominantly empirical and analytical. Obviously, this research is not taking place in a vacuum; how has political science dealt with these issues up to now? What happens when we pass from history to theory and political analysis? What are the shortcomings one has to avoid or remedy and the ‘good (analytical) practices’ to be acknowledged and endorsed? POPULISMUS will thus advance a detailed inquiry into the validity and limitations of the concept of populism as it is currently used in political analysis and public discourse. Indeed, the passage from theory to empirical study complicates things even further, especially given the immense proliferation of populist phenomena in contemporary global politics. To be able to account effectively for such a globally pervasive, multi-layered and ambivalent phenomenon is today’s analytical challenge, if not duty, for frontier political research. Responding to this challenge, POPULISMUS seeks to develop an innovative hermeneutics of populism able to document, organize and interpret in a comprehensive and rigorous way this complex and expanding body of empirical material. This is precisely what existing approaches have largely failed to achieve. The lack of a sufficiently flexible yet rigorous theoretical and conceptual framework has resulted in the production of isolated case-studies employing diverse theoretical perspectives and methodologies and thus forestalling the emergence of a comprehensive mapping and interpretation of populist politics at the global level. Thus, the resulting fragmentation creates difficulties not only for the analysis of populism in a comparative/global perspective, but also at the conceptual level, to the extent that researchers often tend to elevate their limited, particular geographical focus to a universal criterion, thus leading to idiosyncratic and incompatible conceptualizations of populism. The most significant example of this problem is recent analyses of European populism. Indeed, there is no doubt that in today’s Europe, the word ‘populism’ usually refers to right-wing populism or the populist extreme right. In addition, in most cases this association assumes a restrictive form. If, however, what we are currently facing is the pan-European rise of a nationalist, xenophobic, exclusionist and, very often, violent extreme right, is the concept of ‘populism’ the proper analytical instrument through which the problem should be perceived, categorized and debated? What are the implications (direct and indirect) of such a naming and the analytical risks involved in such a restriction, which is both conceptual (reducing populism to the extreme-right) and geographical (examining the European situation in isolation from its global populist context)? Indeed, lacking a rigorous yet flexible theoretical/conceptual grounding, most European analyses of the extreme right seem to suffer from a certain euro-centrism. What thus becomes evident from our analysis is the need for a conceptual and methodological framework able to avoid the risk of such a short-sighted euro-centrism. Such a framework should be capable of breaking the near-exclusive association between populism and the extreme right and registering, on a first level, the existence of both right-wing and left-wing variants of populist claims, demands, movements and parties. On a second level, however, this framework should also be able to provide adequate criteria to distinguish populism from ideologies, discourses and movements that include references to the people in political projects that are predominantly nationalist, racist, authoritarian, etc. POPULISMUS aims at articulating such a research framework. Apart from these correctives, a rigorous analysis of populism determined to overcome ‘the poverty of euro-centrism’ should also move beyond the fetish of the European case-study and embrace a truly comparative methodology. This is an orientation we have already, if hesitantly, started to see in the relevant bibliography and also what the POPULISMUS project is designed to attempt. In other words, it is time to take seriously into account the complexity and historical/political variability of populism(s) as well as its inclusionary potential, a potential most visibly present in contemporary Latin American experience but also marking traditional populism(s) such as US agrarian populism of the 1890s. How can political science register this potential in a relatively impartial and non-partisan way? Here Mudde and Kaltwasser’s central distinction between inclusionary and exclusionary populisms acquires much relevance and may provide a valuable tool for the analytical framework necessary for the POPULISMUS project. Provided, of course, that this distinction is disengaged from an essentialist, anti-historical tendency that attaches each type of populism to a different continent. 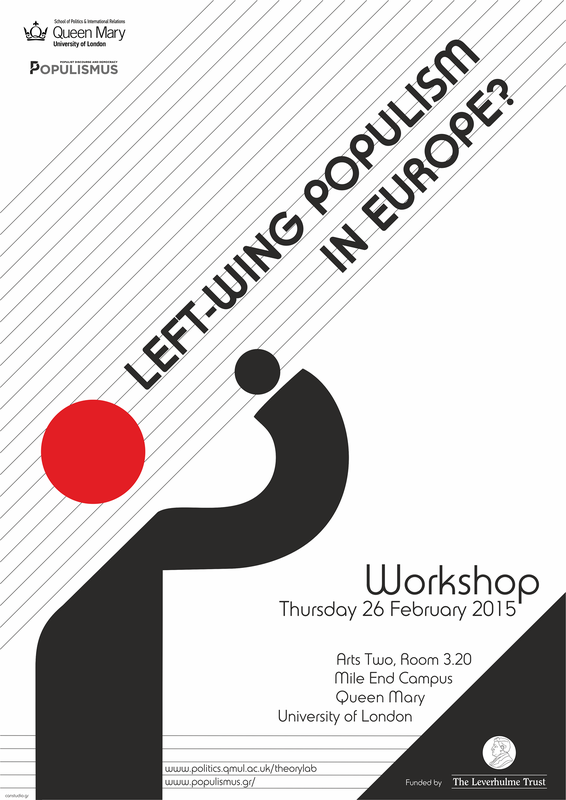 If this is the case, it is an urgent priority to critically assess the new landscape and study left-wing, inclusionary populisms in a comparative and cross-regional perspective in order to fill this significant gap in the relevant bibliography, marked by the equation of populism with the European extreme-right and an exclusivist, if not xenophobic, worldview. Following this direction, Work Package 2 of POPULISMUS involves a series of research activities pertaining to areas of interest around the world: Argentina and Venezuela in Latin America, the US (in particular hotspots associated with ‘Occupy Wall Street’ and Tea Party movements), and Europe (including hotspots associated with right-wing populism as well as with the ‘Indignant’ movements in Spain and Greece). In Work Packages 3 and 4 this material will undergo consistent waves of analysis, based on three case-studies: (a) Contemporary left-wing populism in Latin America, (b) Extreme right-wing populism in Europe, and (c) The populist/anti-populist cleavage in times of crisis. On top of documenting and analyzing in detail the extreme variety of populist discourses which circulate internationally, the proposed case-studies will reveal potential flaws in our analytical model and indicate necessary revisions. Here, substantial gains are envisaged both in terms of analytical/theoretical development and methodological efficiency. The material collected will also be crucial in producing an electronically accessible index of populist phenomena and of the discursive uses of ‘the people’ in political discourse around the globe, in the form of an open access web-based Observatory (Work Package 4). This general orientation is not, however, capable of resolving the crucial methodological question of the ‘how?’ Here, POPULISMUS purports to facilitate a truly meaningful comparison between diverse populist phenomena (as well as between distinct anti-populist reactions) and thus stands to benefit from research conducted within the area of comparative politics without that involving an all-out embrace of comparativist methodology. Our hypothesis is that this task will be greatly assisted by the identification of relatively formal criteria able to categorize the way representations of the people are discursively organized; in fact, it should not go unnoticed that in recent comparative approaches of populism the core unit of analysis entrusted with such a function is ‘populist discourse’. Our analysis up to now has highlighted a series of difficulties in employing a slippery and unstable concept such as ‘populism’, difficulties that emerge simultaneously at the levels of symbolic and historical variability, antagonistic representation and comparative application. As we have seen, in order to effectively deal with such problems it is important to define ‘populism’ in a rigorous yet flexible way, using criteria able to capture the ‘bounded variability’ peculiar to this phenomenon: Which could these criteria be? And how can they be identified? These are questions only a true theory of populism can answer. And how have theories of populism answered them up to now? Generally speaking, one can discern two distinct traditions in the part of the relevant literature that has escaped a narrow analytical focus and engaged with concept formation: a substantive/normative and a formal/structural orientation. Some brave attempts to articulate a wide-ranging ‘theoretical’ approach with ‘global’ pretensions have largely operated by way of producing a checklist of institutional, ideological and organizational ‘symptoms’ that supposedly define a populist movement or discourse, creating at the same time various typologies of populism(s). These symptoms include hostility towards institutions, anti-elitism, an unmediated emphasis on the role of the leader, etc. No matter how useful such classifications can be, they have been unable to integrate the ideal-types formulated on the way into a comprehensive framework with global reach, a framework that would be sensitive both to the historically specific experience of different countries and areas as well as to the universal forces that determine identification processes and identity formation. In other words, they have historically failed to produce operational definitions of populism, to illuminate what is unique to populism as a type of interpellation and an object of collective identification, and to clarify the relation between populism and democracy. Can one identify, after all, a central core present in all the global manifestations of populism? Locating such a common core is, undoubtedly, the holly grail of all theories of populism. The question is where exactly is this to be located: in the content, the positively defined characteristics of populist movements, practices and ideologies? Or in the way such ideological, organizational and other contents and characteristics are formally structured and meaningfully organized? One of the premises of POPULISMUS is that the first option can be of very limited use and thus a formal orientation needs to be adopted. This research decision is substantiated on the basis of a detailed analysis of the failures of substantive/normative approaches (such as the one initiated by Taggart), a failure facilitating a reluctant turn to a formal/structural orientation even in mainstream approaches (such as the ones put forward by Hawkins as well as in the recent work of Canovan and Mudde & Kaltwasser). Indeed, in recent work typical of the ‘mainstream’, the discursive influence towards an increasingly formal approach is visibly present, even if the relevance of Laclau’s work and the Essex School, although acknowledged, is rather disavowed. It is only, however, by fully embracing this discursive orientation that a new promising avenue for the analysis of populism can emerge. In its diachronic development, the Essex School has managed to refine a series of analytical and methodological tools permitting it to grasp the constitutive representational aspect of identity formation, thus registering the ‘linguistic’ and ‘constructionist’ turn in the social sciences, as well as the way the hegemonic appeal of such discursive articulations depends on processes of emotional investment, thus taking on board the so-called ‘affective’ turn. All that has been the result of a sustained commitment to interdisciplinarity, enlisting a multitude of disciplinary and theoretical resources (from semiotics and deconstruction to post-analytical philosophy and psychoanalysis) in the service of a diversified (Gramscian) theory of hegemony. It is also important to note that the last period has also signalled a significant increase in the empirical applications of this supposedly over-theoretical framework. Studies of populism have been central in this development and POPULISMUS is designed as a further step in this trajectory. Apart from utilizing the insights already elaborated within this paradigm (and associated analytical categories such as articulation, nodal points, empty signifiers, equivalence and difference, etc. ), POPULISMUS purports to advance further the cross-fertilization between the Essex School, corpus-based and frame analysis approaches as well as other orientations within this field, something that is anticipated to enhance our conceptual apparatus, our research tools as well as help us develop web-based procedures related to the development of a complex interactive Observatory (Work Package 4). Approaches to populism elaborated within a discursive framework or influenced by it, have indeed contributed a series of operational criteria promising to resolve the aforementioned analytical limitations undermining many existing approaches. In particular, they highlight the importance of ascertaining whether a given discursive practice under examination is: (a) Articulated around the nodal point ‘the people’ or other (non-populist or anti-populist) nodal points, and, (b) To what extent the representation of society it offers is predominantly antagonistic, dividing society into two main blocs along equivalential lines: the establishment, the power block versus the underdog, ‘the people’ (in opposition to dominant political discourses asserting the continuity of the social fabric and prioritising non-antagonistic technocratic solutions). This formal emphasis is visible already in Laclau’s work in the 1970s, but is further enhanced in his more recent work. Thus Laclau’s recent work on populism can be seen as a further step in strengthening his structural/formal approach to populism. Here, it becomes clear that a discursive analysis of populism moves beyond the assessment of empirical contents – ideological, organizational, etc. – and focuses on form. This entails a move of the whole scope of analysis from ideologies and movements not only to discourse but to discursive practices constructing ‘the people’ by employing an equivalential articulatory logic. This heightened formalism is clearly analytically enabling to the extent that it substantially helps in the construction of a concept of ‘populism’, which is both rigorous and flexible and thus able to guide empirical analysis at a comparative level. Building on this challenging theorization of political identifications elaborated by the so-called Essex School of discourse analysis, POPULISMUS seeks to resolve the tensions found in existing approaches in an original and persuasive way. By placing emphasis on the formal aspect of discursive articulations, this novel interdisciplinary approach promises to bridge a crippling theory/analysis divide, allow the formulation of a truly operational definition of populism and facilitate a challenging inquiry into the mobilization of symbolic resources and passionate investments for as well as against ‘the people’ at a global level. Through its research in a variety of contexts (Latin America, the US and Europe; Work Package 2), POPULISMUS purports to test a variety of hypotheses elaborated from a discursive point of view, anticipating research gains at the analytical level but also seeking feedback for a further elaboration of this theoretical framework. For example, a discursive orientation seems to be able to provide adequate formal criteria to distinguish populism from ideologies, discourses and movements that include references to the people in political projects that are predominantly nationalist, racist, etc. Obviously, the stress of the Essex School on discursive articulation predisposes us to first inquire on the structural location of populist signifiers within a particular discourse: for example, where is reference to ‘the people’ located within, say, an extreme right-wing discourse: does it function as the nodal point, as a central empty signifier? Or is it rather located at the periphery of the discursive structure under examination, relegated to a mere moment in a wider discursive articulation? If, that is to say, the aim of European right-wing populism is to defend and reassert nation and race, then maybe these discourses should be categorized under the ‘nationalist’ and ‘racist’ rubric where references to ‘the people’ can only be peripheral and/or secondary. In this sense, a discursive approach points to the challenging hypothesis that, to the extent that they rely on a representation of the socio-political field divided between a national inside (linked to the nation as heartland) and outside (linked to an enemy nation or to groups not belonging to the ethnic community, such as immigrants) exclusionary discourses usually associated with the extreme right should not be labelled and treated as populist. This hypothesis will be properly formulated and researched within the scope of the POPULISMUS project. What is also thus posited as an important research question is the relationship between the ‘people’ and other signifiers with which it competes at the level of political antagonism and to which it can establish relations of articulation and/or antagonism: class, multitude, etc. What also needs to be clarified here is the relationship between horizontality and verticality as distinct but interdependent modes of political action in contentious movements and parties related to such distinct interpellations. At the same time, a discursive orientation seems to be able to illuminate important debates within the study of populism, including: its association with periods of economic and political crisis as well as the question of the relationship between the populist/anti-populist divide and cleavage theory. We have recounted up to now a series of arguments substantiating the grounds on which POPULISMUS adopts a discursive methodology, some of the conceptual and analytical gains expected and the hypotheses formulated. However, the Essex School approach is also marked by a certain ambiguity as far as some of its implications are concerned and POPULISMUS will deal with them in a straightforward way. For example, it may be the case that an excessive formalism, visible in Laclau’s degreeism, involves the risk of losing the conceptual particularity of populism as a tool for concrete (comparative) political analysis. Thus, POPULISMUS opts for a formal/structural conceptualization of populism aware of the limits of formalism (degreeism and conceptual over-extension) and thus capable of mediating between the ontological level and the ontic level of the signifying reality of concrete political struggles; serving as an interface between theoretical analysis and the reality of political practices. In that sense, reference to the structural location of ‘the people’ remains crucial as a defining criterion in the analysis of populism, together with the criterion of equivalential articulation. At the same time, POPULISMUS will take very seriously into account the criticism addressed towards the Essex School with reference to the importance of affect and emotion in political life. How is emotion and affectivity to be thoroughly articulated with a discursive logic? And how is this articulation to guide the empirical political analysis of populist phenomena? How can one evaluate Laclau’s orientation in articulating the two up to now and what new theoretical resources (from psychoanalysis and beyond) can assist this process? What will be the results of this articulation in terms of establishing the status of the affective dimension in populist identification? What will be the place of ressentiment here and what other emotions are relevant? Last but not least, what role does this orientation ascribe to the leader as a physical person and, most importantly, to her/his name? Here, additional help can be provided by psychoanalytic theorization as well as by innovative explanations of charisma such as the one put forward by the social anthropologist James Scott. By advancing a flexible yet rigorous conception of populism POPULISMUS aims at illuminating a further major point of contention in the ongoing debate: the troubling relation between populism and democracy. As we have seen, the particular ways through which some populist movements articulate their claims to represent ‘the people’ –relying on charismatic leaders, energized by ressentiment, virtually bypassing the institutional framework of representative democracy and/or often containing an illiberal, anti-rights and even nationalist potential– have portrayed populism as a threat to democratic institutions. And yet such a conclusion fails to do justice to the immense variety of populist articulations and does not take into account its inclusionary variants; it may even erroneously apply the term to movements and discourses that are outright nationalist, fascist and racist. It is also premised on a hypostatization of modern democracy, which fails to register its paradoxical formulation on the basis of articulating two distinct political traditions, the liberal and the democratic one. Indeed, by representing excluded groups, by putting forward an egalitarian agenda, other types of populism – the populist canon, if our hypothesis is correct, combining the formal populist core with the legacy of the (radical) democratic tradition – can also be seen as an integral part of democratic politics, as a source for the renewal of democratic institutions. POPULISMUS will thus focus on the crucial question put forward by Mudde and Rovira Kaltwasser: should populism be considered as a threat or as a corrective to democracy? Or maybe as both? And under which conditions? In addition, to the extent that this particular phrasing of the debate tends to imply that ‘democracy’ refers to only one particular institutional arrangement on which consensus exists, clearly a very simplified picture of a much more complex historical dialectic, POPULISMUS will also explore the possibility that what is at stake here is the antagonism between different conceptions of democracy (radical/participatory vs. elitist). But even if one stays within the framework of a liberal democratic model, what does the dynamic ‘return’ of ‘the people’ reveal with regards to the state of democratic institutions in the 21st century? If popular sovereignty and representation have been the victims of the post-democratic, technocratic transformation of liberal democracies in an age of advanced globalization, is populism symptomatic of the need for a new type of democratization? And since the European construction is increasingly suffering from such a post-democratic malaise can a ‘return to the people’ play any role in reversing this trend? What are the risks involved here and how can they be addressed by contemporary political theory and analysis?